Top Resort: 10/10/10. HWY 160 & Winery Rd. 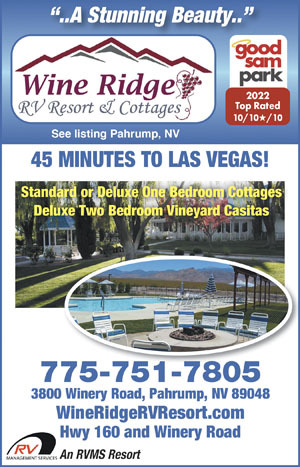 42 Cottages; new 2-bed Casitas; large, 42 one bed cottages, 129 perfect FHU 50-amp level RV sites. Private bath suites, 2 pools w/spa, free LD phone, free waffle breakfast M-F.
We stayed 2 nights to make a day trip into Death Valley NP. 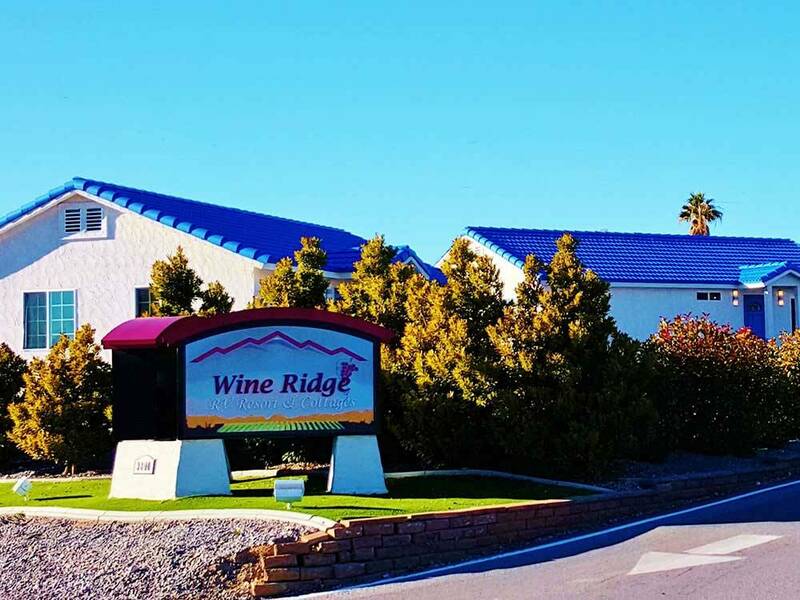 The park is located on the outskirts of town requiring a drive through a residential area along 2 lane paved roads. The transition from the city streets to the park required negotiating a significant grade change posing a scraping hazard. Then a climb up a single lane paved entrance road to the registration parking area. Then yet another climb up to the site area passing over several speed bumps. The park was built on a significant slope. There was an attempt to tier the sites level but not all of them appear level. The interior roads are paved and sites are gravel. The roads and turns were negotiable. There was a mixture of pull through and back in sites. The P/T sites were long enough for larger coaches with their toads attached. Sites had sufficient room for opening slides. They have full hook ups – water, electricity (50/30/20 AMP), & sewer. The utility connections were at the rear of the site requiring parking at the rear of the site to reduce hose/cable runs. The sewer connection was at the ground level so it was easy to establish a downhill flow. Distance and gravel areas establish privacy between the sites. There was not an outside table or fire pit. There seem to be some long term residents. There were a few trees scattered among the sites so satellite reception was dependent on site assignment. The park did not provide cable TV and there was no information about broadcast channels. Didn’t try to get any broadcast channels. The park provided WiFi was “meant for casual use only; emails and light browsing” so we didn’t try to use it. It was password protected. Our Verizon WiFi hotspot worked well. Didn’t try the NET10 phone so don’t know about the reception. There was fenced pet area in a corner of the park. The ground cover was small pebbles and artificial grass. There was a bag dispenser and waste collection station in the park. There was adequate space along the park’s road to exercise a dog but there were no bag dispensers and waste collection station around the park. We didn’t use the restrooms, showers, laundry room pool or hot tub. If we returned to the area, we probably would stay at another park in town. TIP: We were invaded by a pack rat in the engine compartment of our 41’ MH within hours of settling in. Discovered later, it appeared the pack rat made it into the engine compartment of toad as well. Visited a freind who stays here year round. RV spaces are gravel with a concrete pad on the door side of your RV. My site was very easy to back into and set up. All sites are level, did not need to level RV. Host was very freindly. Rest rooms and pool were very clean. Sites have small trees that will provide more shade as they age. Will visit again.